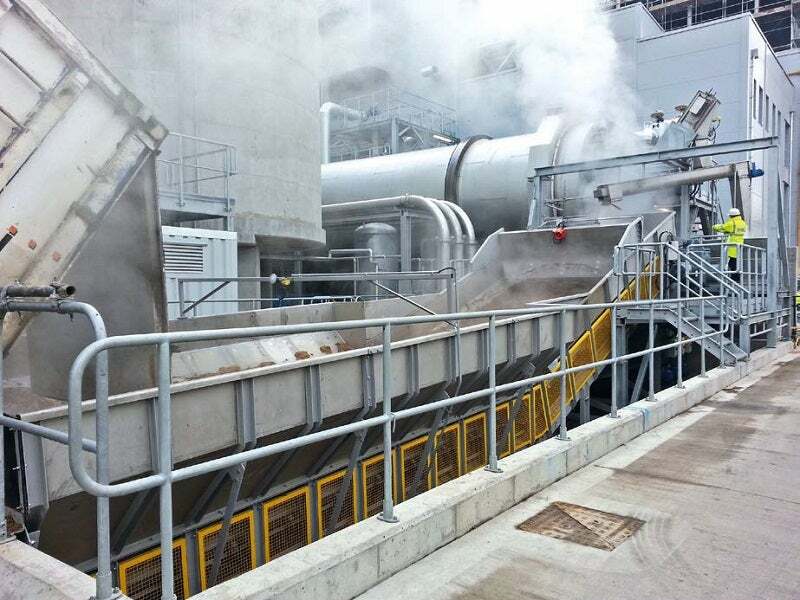 Aalborg Energie Technik (AET) has placed a repeat order for a Samson® Material Feeder for the reception of biomass at a power plant situated in Newark, UK. AET specialises in providing engineering solutions for biomass-fired boiler plants and had previously worked with SAMSON to provide Material Feeders for a project in Morayshire, Scotland. This new Samson® Material Feeder will receive MBM (meat and bone meal) direct from 28t tipping trucks and 35t front end loaders before conveying the material onto a screw conveyor for incineration. The Samson® Feeder includes a 3m-wide rubber belted apron design unit mounted on a steel structure and supported by double apron bars located at every pitch of the conveyor chain. To accommodate a variety of trucks and loaders the universal entry point includes a 4.5m-wide flared entry section, increasing the volume of the feeder entry and reducing vehicle alignment time. The equipment belt is oil and fat resistant and fasteners and belt cleats are produced in stainless steel to increase the longevity of the equipment. This feeder unit is designed to receive material at a variable rate up to 600m³/h and discharge material at a variable rate up to 180m³/h. The hopper itself provides a holding capacity of 60m³.